Easter Sunday services around the world have prayed for an end to the persecution of Christians, commemorating the students massacred in Kenya. The Archbishop of Canterbury has urged Christians to resist persecution without resorting to violence in his Easter Sunday sermon at Canterbury Cathedral. The Most Rev Justin Welby also called on Christians to support persecuted communities, with love and goodness and generosity. Speaking about the recent attack in Kenya the Archbishop described the victims as "martyrs". To witness is to be a martyr. I am told by the Coptic Bishop in England that the Coptic Christians murdered in Libya last month died proclaiming that Jesus Christ is Lord. They are martyrs, a word that means both one that dies for their faith and one that witnesses to faith. There have been so many martyrs in the last year. On Maundy Thursday, three days ago, around 150 Kenyans were killed because of being Christian. They are witnesses, unwilling, unjustly, wickedly, and they are martyrs in both senses of the word. These martyrs too are caught up in the resurrection: their cruel deaths, the brutality of their persecution, their persecution is overcome by Christ himself at their side because they share his suffering, at their side because he rose from the dead. Because of the resurrection of Jesus from the dead the cruel are overcome, evil is defeated, martyrs conquer. The Queen, Duke of Edinburgh and other members of the Royal Family have attended an Easter Sunday service at St George's Chapel at Windsor Castle. The Archbishop of York has said Christians need to be involved in politics and that it would be "absurd" to suggest that there are some areas of God's world that are out of bounds. Dr John Sentamu wrote in The Mail on Sunday: "Faith centred on Jesus Christ insists that concern for others' wellbeing means political involvement (that is the deliberation and participation in how we are to be governed). "When they pillory bishops and others for daring to invade the territory hitherto regarded as their private preserve, they are suggesting there are some areas of God's world that are out of bounds to Him. That is as absurd as it sounds. "There are followers of Jesus Christ in all the main political parties in the UK. It is not for me to tell their fellow church members how to vote next month, but I will encourage them to use their vote." The Archbishop also said that Christians are not excused suffering, and in many parts of the world are at greater risk because of their faith. The Archbishop of Canterbury, the Most Rev Justin Welby, has delivered his Easter sermon at Canterbury Cathedral. He began by wishing the congregation "a Happy Easter" and thanking all those involved in helping put together the service. "Thanks to all who have prepared this service so wonderfully. It's always slightly embarrassing as people go out and say 'Oh what a wonderful service' and I think I had absolutely nothing to do with it". Pope Francis used his Easter Sunday address to pray for an end to the persecution of Christians, commemorating the students massacred in Kenya. The Pope delivered a mostly sombre "Urbi et Orbi" message: "We ask Jesus, the victor over death, to lighten the sufferings of our many brothers and sisters who are persecuted for his name, and of all those who suffer injustice as a result of ongoing conflicts and violence - and there are many." The pope spoke as churches in Kenya, where al Shabaab gunmen massacred nearly 150 people, turned to armed guards to protect their congregations. Ukip leader Nigel Farage has wished people a "restful and enjoyable day" this Easter. Happy Easter to all. I hope you have a restful and enjoyable day. Deputy Prime Minister Nick Clegg has said Easter "is a time of reflection and renewal" as it celebrates the story of Jesus’ sacrifice and resurrection. He also said the values that Jesus lived his life by "compassion, humility and forgiveness, resonate with people of all faiths, and none." "Easter is also a time that many people spend with their families, relaxing and enjoying the break in their different ways", he added. Labour leader Ed Miliband said "fear and uncertainty" were issues for Christians both in the UK and abroad as he delivered his Easter message. Miliband wrote in a Facebook post: "In the midst of the Easter celebrations our hearts go out to those who face difficult times both overseas and closer to home. "My thoughts are particularly with Christians in Syria, Iraq and other countries where the church suffers terrible persecution." 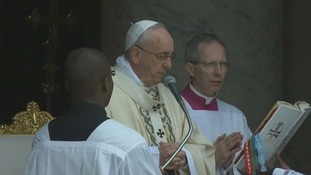 Roman Catholic crowds have gathered in St Peter's Square despite the rain to listen to Pope Francis' Easter address. David Cameron said Easter is a time to reflect on the part Christianity plays in British life as he delivered his party's Easter message. "The Church is not just a collection of beautiful old buildings, it's a living, active force, doing great works right across our country," the Prime Minister said. "Yes we're a nation that embraces, welcomes and accepts all faiths and none, but we're still a Christian country," he continued. Cameron stressed that his government will continue support Christianity both at home and abroad. After a grey start to the long weekend for many, slowly improving into tomorrow. Spring finally returns just in time for Easter Sunday.